Wild colonies of honey bees commonly nest in old, hollow or rotted-out trees. The bees can easily become a nuisance when spring arrives. The bees will congregate around swimming pools and bird feeders where people may commonly get stung. 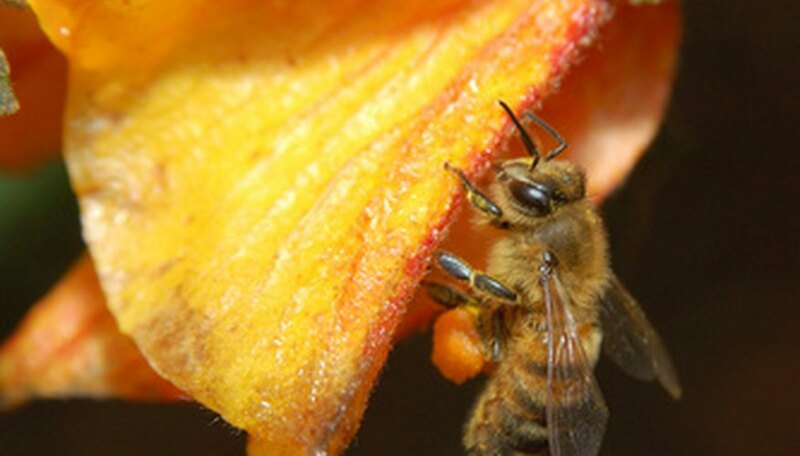 Many people are allergic to bee stings and can even experience a life-threatening reaction. Destroy honey bee nests in the spring or early summer. Spray the hive at night when the bees are in the hive and they are the least active. If the nighttime temperature dips below 50 degrees Fahrenheit, bees rarely will fly out of the hive during spraying. Wear long sleeves, long pants, gloves and a hat while killing a hive. If you have access to a beekeepers bonnet and gloves, use them to prevent painful stings. Spray the hive using a bee-killing aerosol spray. Follow the directions on the label for application. Focus on the hive's main entrance when spraying. Thoroughly saturate the area. Watch the hive for three days to make sure there is no activity. If you see bees leaving or returning to the hive during the day, repeat the application until you can go three days without observing any activity. Destroy the hive once all bees are dead. If the hive is located in a tree cavity, scoop out the dead bees, hive and honeycomb. Thoroughly wash the area of all honey using dish detergent and water. If the hive is not removed or thoroughly cleaned of all honeycomb and honey, ants and beetles may invade the tree. The only way to make sure you prevent reinfestation is to cut down the tree. Never attempt to kill a hive of bees if you suspect you are allergic or suffer from a known bee allergy. In that case, rely on a professional. Based in Oregon, Kimberly Sharpe has been a writer since 2006. She writes for numerous online publications. Her writing has a strong focus on home improvement, gardening, parenting, pets and travel. She has traveled extensively to such places as India and Sri Lanka to widen and enhance her writing and knowledge base. Where Do Wasps Migrate to in the Winter? What Kills Bees and Wasps?